From Portland, USA and with releases on Deranged, Dirtnap and Taken By Surprise records. 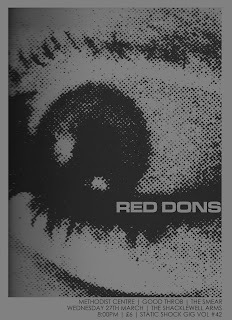 Red Dons will be playing three UK shows when in town to record their next record and this is the only one south of Leeds. Featuring members of The Observers, Clorox Girls and Thee Spivs among others. Queer Oi/Street punk from London with two drummers, this is going to be one of their last ever shows. Don't miss out. First show from this new local band, featuring members of Tremors, Wake Up Dead and Vexed playing gloomy post punk along the lines of The Wipers.